Welcome to our new and improved hub for all of the games we play or are involved in. Join our 40mm Facebook group to enjoy gaming in slightly bigger scale. Much of my gaming time has been taken up with playing Blaze Of Glory again. 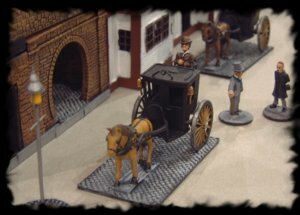 I am busy writing a 3rd edition of the rules and am building a new wild west town - Persistence- in 40mm. Keep an eye on the BOG site as this project unfolds. Has taken a bit of a back seat recently. I still aim to make a mini site for it to show off our 40mm figures in all their glory. Watch this space. Pete is still playing EOE and I get to every now and then. Too many ideas not enough time. Who are SPIRIT OF THE GAME? We are a small group of friends in Essex who have played various tabletop wargames together for the last 25 years. Over the years we have played many different systems - fantasy, sci-fi and historical. These days we mostly play games of our own devising. However we do still dable with other games systems. PLEASE NOTE WE ARE NOT WHO ARE VERY NICE PEOPLE WHO SELL GAMES, FIGURES AND SCENERY. WE DO NOT SELL PRODUCTS WE PLAY OUR OWN AND JUST WRITE ABOUT THEM HERE. IF YOU WANT TO BUY A VARIETY OF GAMING ITEMS CLICK ON THE IMAGE ABOVE, IF YOU WANT TO FIND OUT MORE ABOUT THE GAMES I PLAY WITH VARIOUS FRIENDS READ ON! To find out more about us and what we do, explore the sites below. Why SPIRIT OF THE GAME? Playing in the 'spirit of the game' then is the most important element of what we do. What's this site for then? As we have developed new games or campaigns we have produced websites for them, this site acts as an umbrella for those other sites allowing you to visit various sites produced by us, and hopefully encourage you to play in the spirit of the game. N.B. This site is run by gamers for gamers. Where we refer to someone else's product we do so IN THE SPIRIT OF THE GAME no infringement of copyright is intended. All of our sites provide relevant links to the copyright holders and to other manufacturers. A skirmish game set in an alternative history, ranging from 1880 to 1939. 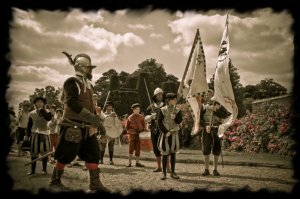 Join us as our Victorian gentlemen and lady heroes rove the world performing deeds of daring do, and generally saving the world from the machinations of the forces of evil. A Wild West tabletop skirmish game. A skirmish wargame of our own devising. Now in its third edition. This version has been written to compliment our growing 40mm collection but it could easily be used with 28mm figures too. Refight the shoot outs of famous westerns, or create your own campaign. 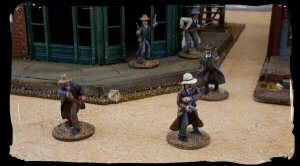 At this site you will find full rules to fight your own Wild West gunfights, including downloadable versions, tips on how to build scenery, links to relevant figure suppliers, an insight into our narrative campaign and much more. An unofficial supplement for Warhammer/Mordheim. 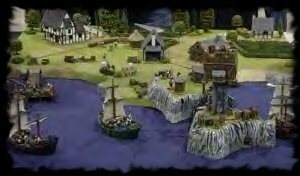 This is a legacy site for our OldHammer/MiddleHammer game Warhammer Ahoy! There are some details of ships rules and models. I hope to add other archive material at some point, but don't hold your breath. A 28mm skirmish game set at the end of the 16th Century. England is at war with Spain. The Armada is trying to land troops and the Trained Bands of Southern England are forced to fight for their lives. This is an adaptation of the Warhammer Historical Legends system. Join us on this new venture.